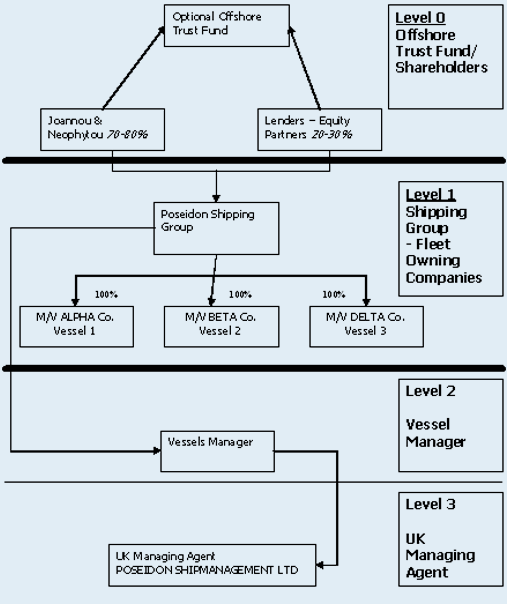 Poseidon Shipping Group: The Group company is due to be incorporated. However for operational, legal and financial(taxation) reasons this company has to be an offshore company. Negotiations will reveal the most suitable jurisdiction in which the Poseidon Shipping Group is to be incorporated. Suggested jurisdictions include the US, UK, Liberia, Greece, Cyprus British Virgin Islands and Panama. Contracts for vessels registered in Great Britain, Liberia, Cyprus, Netherlands, Netherlands Antilles, 2nd German Register, Bahamas, Antigua and Bermuda, NIS inc./exc. Union Cover and Collective Bargaining Agreements (CBA's) with ITF or National Unions.